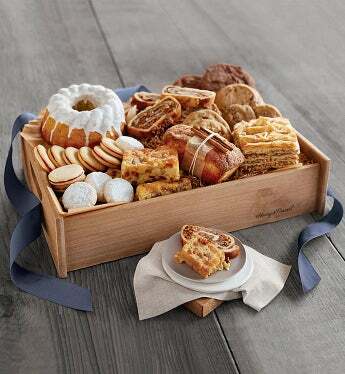 The Signature Bakery Basket, complete with a gourmet wooden tray with handles, elegantly presents a selection of our bakers' finest creations. Perennial favorites like our signature baklava and pineapple macadamia nut cake complement an array of classic cookies and cakes, and we've topped them off with our buttery raspberry galettes and mouthwatering lemon shortbread cookies. This artful arrangement serves well at close-knit family gatherings and evening galas alike.